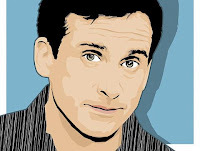 I interviewed Steve Carell, the nicest guy in the world. Tonight I’m going to the Swervedriver show in Williamsburg. Last time I saw them, in 1998, they brought it, hard-style. If they bring it this time, I may crowd-surf! Or at least pretend to. Posted on June 12, 2008 by johnsellers	This entry was posted in Uncategorized. Bookmark the permalink.